If you are looking for the best place to buy bilberry tea I would like to suggest two of my favorite place. 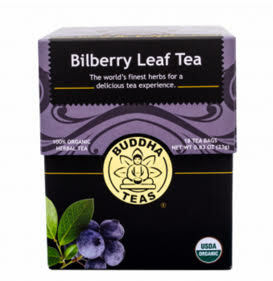 The first is Buddha Teas for people who want to enjoy bilberry with a tea bag. The second is Starwest Botancals and is for people who want the leaves to make their own tea. They both have their positives and you’ll see that in this article. Before you do, I’d like to show you all the wonderful health benefits of this herb. Bilberry is a rich source of antioxidants and one the best known to man. Antioxidants are generally good for your health and help against heart, eye, memory, immune system and mood problems. There’s been rigorous testing done on bilberry to prove it’s the most helpful herb for your eyes. It’s the number 1 remedy, and preventative food, for macular degeneration (the top reason for blindness in people over 50). It’s also superb in cataracts. In one Italian study, 50 participants with early stage cataracts were given bilberry extracts 3 times a day; bilberry stopped a whopping 97% of cataract progression in all participants. People suffering from diabetic retinopathy (eye problems with diabetes) showed significant improvement when treated with this herb. In short: Bilberry is great for your eyes and most eye problems. Also, bilberry is loaded with a compound known as anthocyanins. This compound lowers cholesterol and keeps your heart healthy. Plus they have great anti-aging effects. This tea is excellent in so many ways. It tastes very good too (a lot like blueberries). This is a very conscious company. The founder, John Boyd, knows that to make the best teas possible he needs to use the most natural and organic ingredients he can find. They offer plenty of options with bilberry too. If this is your first time trying bilberry and you aren’t sure if you are going to like it, you should go with 1 box. It comes with 18 tea bags and costs $8.49; that comes out to around 46 cents per cup of tea. I don’t go to Starbucks very often but I believe a tea there is around 5 bucks. A cup of tea a day will cost you under $15 for a month with Buddha Teas and will cost over $150 a month if you buy from Starbucks. That’s a huge difference! I’d recommend these options for people who love teas and know they are going to be drinking them often. There’s free shipping for orders over $50 too. They literally have any tea you can think of and you can order all your teas there to take advantage of the free shipping. Starwest is another company that grew because of their high quality products. They started out as a small retailer in California 45 years ago and now is one of the largest suppliers of herbs in the world. This option is for people who like to make their own bilberry tea with USDA Certified Organic bilberry leaves. Some people feel tea bags filter out the delicate taste of herbs, and if you are one these people, Starwest is perfect for you. Like Buddha Teas, Starwest offers different bilberry options. 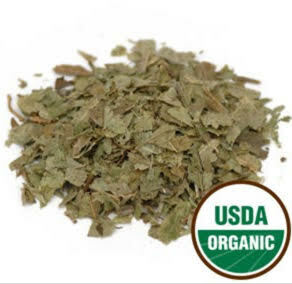 The smallest amount, 4 ounces, is very reasonably priced at $8.00. If you are new to making your own teas, this is what I would recommend. This way you can get all the kinks out on a small order. If you are an experienced tea maker than I would suggest the second option, 1 pound for $21.58. Preparing the tea is pretty simple too. To make, pour a cup of boiling water over 1 teaspoon of the leaves, cover and steep between 5 to 10 minutes, strain and enjoy. You can drink up to 3 cups a day of bilberry tea. If you plan on using bilberry tea to treat a medical condition, make sure to talk to your doctor first. It’s important to go over options and to get a proper diagnosis. 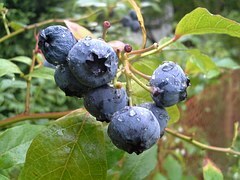 As for bilberry itself, there aren’t many safety concerns. Just don’t over do it. Anything done to excess can be a bad. These are two really great options if you are looking to buy bilberry tea. They both offer multiple amounts to suit your tea drinking habits. Both companies are very well known and offer superior herbs, including bilberry. Which one to buy really depends on how you want to prepare the tea. There’s tea bags for those who love the convenience of that and the leaves for those who love to make their own teas. If you would like to take a closer look at Buddha Teas, click below. If you need anything clarified or want to share an opinion, comment below and I’ll make sure to get back to you as fast as possible. Also, share on social media for friends and family to see. Awesome, yet informative article! Anyone that is well into drinking tea would love this bilberry article. It’s great that you focus so deeply on the benefits of the tea, because that’s what I wanna know! I also love that you include many different options of teas. I love my options. Yeah I believe in optoins for sure. Some people like to use tea bags and others want to control the whole process. I’m glad you found the information useful!